Seattle-based 98point6 raises $50 million to expand its chat-powered “virtual primary care” unlimited service that costs a flat $20 per year for the first year, then $120 in following years. The company’s 15 doctors serve patients in 38 states. 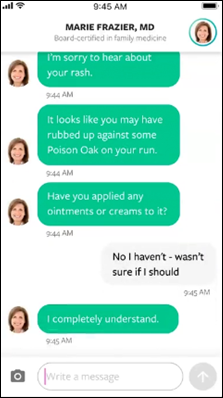 Millennials and others for whom convenience is paramount will probably love turning a doctor visit into a text chat, but calling it “primary care” seems like a stretch since it’s just responding in kneejerk fashion to user-reported symptoms, with no effort made to provide continuity of care or chronic condition management. Anyone want to spend $20 to give it a test drive and let me know how it turns out? I bet the $20 deal doesn’t last long. From Doyenne: “Re: Cerner share price. It’s dropping due to ‘Cernover,’ in which whole metropolitan areas like Seattle, Chicago, and the Bay Area are switching. Contracting: Seattle Children’s and University Washington. Implementing: University Illinois Chicago, Northwestern. Implemented: Dallas Children’s, Packard Children’s, Royal Children’s (Melbourne), University of Utah, Loma Linda, John Muir.” Unverified, and I agree only somewhat. Certainly Epic’s focus on academic medical centers has given it high-profile customers that created regional momentum, but Cerner is still turning in good numbers due to diversification even as Epic has inflicted obvious pain. Cerner talks less these days about big hospital wins, ambulatory, revenue cycle, and CommonWell and instead reassures investors about population health, IT services, non-US sales, sales outside the Millennium base, and its perfectly timed contracts with the DoD and VA (all of which conveniently avoid butting heads with Epic). The biggest questions are how the company will perform given the questionably credentialed replacements it chose for Neal Patterson and Zane Burke; the good or bad PR that will result from whatever happens with DoD and VA; and diversifying its business to meet Wall Street growth expectations while avoiding becoming a GE-like unfocused conglomerate that behaves like a dull mutual fund. Quite a few companies stumble after they lose a fire-breathing visionary leader, but like Apple, Cerner can always keep booking add-on sales of services, accessories, and questionably improved new models to an existing client base that is reluctant to shop elsewhere. My bottom line: while Epic’s business is solely focused on EHR customers and it’s hard to beat (and getting harder) in that market, Cerner is not limited to EHR sales, and investors price its shares accordingly even though we hospital-centric insiders see Epic as the unstoppable juggernaut. From Splainin’ to Do: “Re: startups. This health IT site is charging startups to have their updates and company profiles published as fake news. Do it!” No thanks. That site didn’t even register in the Reaction Data survey of C-level health system executives and charging vendors to run their biased content seems to be yet another way to send readers fleeing. You can sell your integrity only once and you can’t buy it back afterward. I take an infrequent look at the content, advertisers, and overall excellence of sites similar to mine and I don’t see many ideas I’d want to emulate. IBM will acquire Red Hat for $34 billion, apparently hoping to reverse years of declining revenue by trying to compete with entrenched cloud computing competitors such as Amazon and Microsoft. IBM’s bet-the-farm investment in Watson Health may well become the Previous Shiny Object as the company moves to its more familiar roots in enterprise software in hopes of placating impatient shareholders. I’m pretty sure Red Hat customers aren’t thrilled. Cantata Health promotes Krista Endsley to CEO. NTT Data sold its healthcare software business to GPB Capital to create Cantata Health in April 2017, which tapped former NTT Data SVP/GM Mike Jones as CEO through April 2018 when Endsley joined Cantata as president. Oncology analytics vendor Cota Healthcare hires industry long-timer Mike Doyle (QPID Health) as president and CEO. PatientSafe Solutions hires Tim Needham (Burwood Group) as chief commercial officer. A KLAS report on secure communication finds that while ambulatory providers are focusing on simply exchanging messages securely, health systems are moving toward broader, enterprise-level platforms that include interfacing and support for multiple workflows (Voalte and Vocera are furthest along in offering a true communication platform, KLAS concludes). 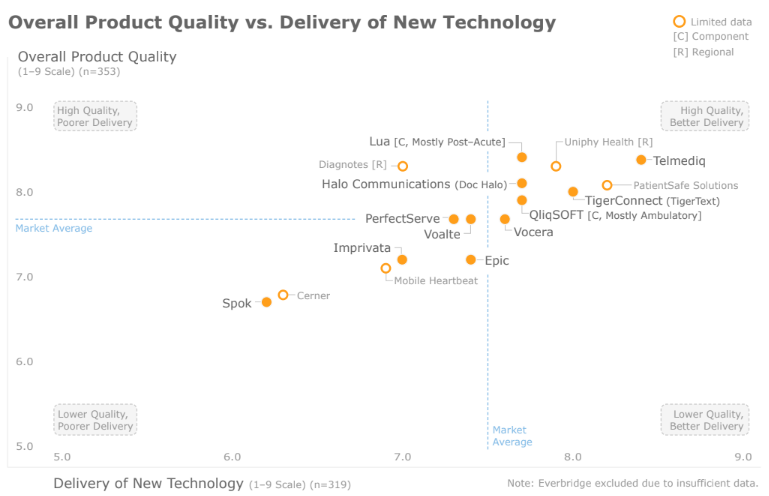 The top vendors (in terms of market consideration, customer retention, and performance) are TigerConnect, Voalte, and Epic. Potential disruptors are Telmediq and PatientSafe Solutions, which have high win rates and quality scores, while KLAS says Spok and Imprivata are losing business due to lagging development. 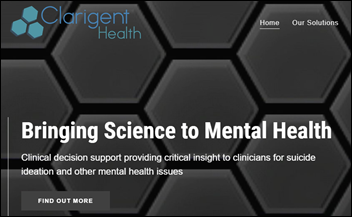 Mason, OH-based startup Clarigent Health will commercialize technology developed by Cincinnati Children’s Hospital that assesses suicide risk by analyzing conversations between patients and their therapists or doctors. Dimensional Insight launches Measure Factory, an automation engine that extends its Diver Platform to support data governance and data integrity. LabCorp adds support for Apple Health Records, which will allow patients to send their lab results to their IPhones. Some Twitterati were puzzled why it only supports IPhones, with the obvious answer being that while Apple is #2 in mobile phone OS behind Android, there’s no Apple Health Records counterpart in Android (Google Fit is mostly just activity tracking). Partners HealthCare and Lifespan end their merger talks, with Partners forging ahead with plans to acquire Lifespan competitor Care New England Health System. In Australia, a report blames Cerner for May 2017 outages at seven Queensland Health hospitals, refuting the health system’s initial claim that the downtime was caused by ransomware. Investigators say Cerner has refused to provide system logs covering the incident. Cerner is the leading candidate to win a new bid for a patient administration system and insiders report executive pressure to avoid putting the company in a bad light. Fascinating: a Utah insurer rolls out a “pharmacy tourism” option in which patients who take expensive drugs will be given plane tickets to San Diego, a ride across the border to Tijuana, and $500 as a cash bonus to buy their drugs in Mexico, where they are so much cheaper that the insurer still saves money. Hopefully Mexico won’t build a big, beautiful wall to keep medical tourism invaders out. Vocera will resell QGenda’s provider scheduling system in the federal healthcare market and the companies will integrate their systems. 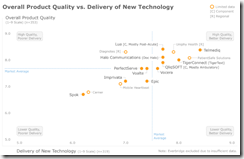 CarePort Health expands its product, analytics, and customer success teams. Impact Advisors is named to Modern Healthcare’s list of largest revenue cycle management firms. AdvancedMD will exhibit at APTA PPS November 7-10 in Colorado Springs. Waterloo MedTech awards Agfa Healthcare with its 2018 Award of Distinction. Aprima will exhibit at the AAP National Conference & Exhibition November 3-5 in Orlando. CarePort Health will exhibit at the ACMA 2018 Leadership Conference November 5-7 in Huntington Beach, CA. CompuGroup Medical will exhibit at the AMP 2018 Annual Meeting & Expo November 1-2 in San Antonio. CoverMyMeds will make its RxBenefit Clarity real-time benefit check tool available to Allscripts users. CTG, Cumberland Consulting Group, and Dimensional Insight will exhibit at the CHIME Fall CIO Forum October 30-November 2 in San Diego. Diameter Health will present at the AMIA 2018 Annual Symposium November 3-7 in San Francisco.